Education Secretary Arne Duncan asked teachers in New Haven, “how do we as a teaching profession create a climate in which everyone is clamoring to come into schools” being turned around under his School Improvement Grant (SIG) experiment. I hope that the word “we” means that his administration and teachers should be partners, and that he will stop aiding “reformers” in their war on teachers. If so, Duncan should start with an apology to teachers in general, and inner city teachers in particular. Yes, Arne Duncan should offer teachers an apology, what has occurred under his watch as Education Secretary has been a travesty to the teaching profession! Duncan seemed perplexed that only one teacher left a top-performing school to join a turnaround of low-performing school. This should be especially unsettling to Duncan because New Haven has worked with the American Federation of Teachers to create a balanced evaluation system. In many or most districts that have responded to Duncan’s campaign to use test scores for firing teachers, leaving a low-poverty school for a turnaround school, where it will be harder to meet test score growth targets, could be career suicide. Exactly! Not many level-headed teachers in districts where keeping your job is tied to test scores are going to leave a high performing schools to move to low performing schools, and have tougher kids and more behavior problems to boot. And that gets to the first reason why Duncan needs to apologize. While he empowered enlightened districts like New Haven, Duncan has also empowered teacher-bashing in Washington D.C., with its abusive top-down IMPACT system for firing teachers. Duncan praised collaborative systems such as Hillsborough and Pittsburgh, while funding efforts in states like Florida and Tennessee to turn schools into test prep factories. 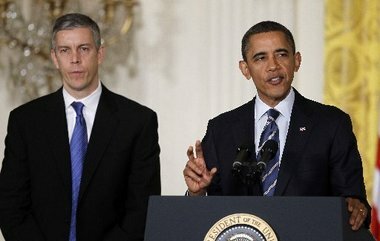 Pressure from Duncan’s DOE is cited as the reason why Buffalomust be willing to fire teachers based on the test scores of chronically absent students, but New York City and D.C. faced no sanctions when they used policies inspired by Duncan’s SIG and RttT to drive out good teachers based on flawed test score models. So, Duncan should start by saying he is sorry for imposing collective punishment on teachers in schools destined for turnaround. His demand that 50% of teachers be replaced in those schools, along with his incentives for using a statistical model for firing teachers, means that effective educators have lost their careers simply because they taught in ineffective schools. His mass dismissals perpetuate the “reformers'” myth that teachers’ “low expectations” are the cause of dysfunctional schools. Under Duncan’s rules, districts did not have to impose litmus tests on teachers or to systematically drive veteran educators out of the profession. But he funded districts that, predictably, used federal rules to get rid of Baby Boomers’ higher salaries and benefits, and to keep veteran teachers from expressing their professional judgments. Another EXACTLY! Effective teachers HAVE been laid off and lost their careers simply because they have taught in difficult schools! Duncan is the epitome of the corporate whipping boy who knows nothing about teaching, but a lot about reforming education through being cozy with the million and billionaires. For instance, two of the three teachers who spoke their minds to Duncan explained that teaching in the inner city is different, meaning that they need more training and supports. A New Haven teacher told Duncan that “teachers who are not familiar with urban education are ‘not ready’ for an environment like New Haven.” Those sorts of judgments are heresy to many school and district leaders, however. Under SIG, expressing such opinions can be grounds for dismissal for being a “culture killer.” Under SIG, administrators are empowered to impose their own culture on schools by getting rid of teachers who believe what The Turnaround Challenge concluded — that instruction-driven reforms, even those fueled by “high expectations,” are inherently incapable of turning around the toughest schools and that schooling must be a team effort. Duncan truly just doesn’t get it. Duncan asked, “where is the badge of honor” that would attract teachers to the toughest schools? The greatest reward for a teacher is the opportunity to teach effectively. We would feel honored, however, if our professional wisdom would be heeded before billions of dollars are spent (wasted?) on market-driven policies that were adopted simply because the “billionaires boys club” liked those types of policies. Had he respected the conclusions of inner city teachers and researchers at the Johns Hopkins Everyone Graduates Center, Duncan could have invested in the human capital necessary to provide mentors and other support staff necessary to make teaching a team sport. He could have invested in a farm club for nurturing talent for the toughest schools. And that gets to the final apology that Duncan owes to inner city students. I have yet to hear a plausible scenario where Duncan’s policies do not produce more mindless test prep and an exodus of teaching talent from the toughest schools. Teaching in the inner city is tough enough without being evaluated based on an experimental model that is unfair to schools where it is harder to raise test scores. Surely Duncan doesn’t believe that monetary incentives, even if they were sustainable, could attract and retain the best teachers. If teaching were just a pathway to wealth and respect, no apology could compensate for the insults and the damage that Arne Duncan has helped inflict on teachers. Teaching, however, is an act of love. Give us an apology and allow teachers to help formulate policies, and all would be forgiven. Duncan, by his rhetoric, seems to indicate that he is realizing that he has placed a number of bad bets while siding with the venture capital school of reform, and now he is saying almost all of the right things. If he is sincere, teachers will be open towards reality-based policies in a second term. If Duncan is sincere, he must know that teachers deserve an apology.